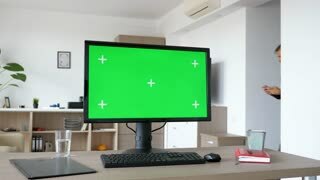 Laptop Computer Showing Green Chroma Key Screen Stands on a Desk in the Living Room. In the Background Cozy Living Room in the Evening with Warm Lights on. Zoom In Shot. 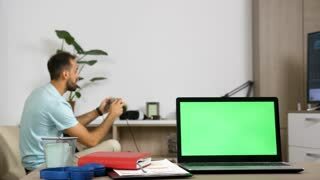 Laptop Computer Showing Green Chroma Key Screen Stands on a Desk in the Living Room. In the Background Cozy Living Room in the Evening with Warm Lights on. Caucasian girl reading interesting post on social media. Young woman laying on sofa with smartphone in hands. Indoors. Living room. Drumbeat in background. Over the Shoulder Shot of Mans Hands Typing on a Laptop with Green Mock-up Screen. In the Background Cozy Living Room with Out of Focus Woman Resting on a Sofa. Man Watching Green Mock-up Screen Digital Tablet Computer While Sitting at the Desk. Man Watching Videos or Browsing Through the Internet. In the Background Cozy Living Room. First Person View of Professional Freelancer Working on Green Mockup Screen Personal Computer From Home. Close-up POV Shot. In the Background Cozy Living Room. Man Holding and Watching Green Mock-up Screen Digital Tablet Computer While Sitting at the Desk. Man Watching Videos or Browsing Through the Internet. In the Background Cozy Living Room. Man Using Hand Gestures on Green Mock-up Screen Digital Tablet Computer in Portrait Mode while Sitting at His Desk. In the Background Cozy Living Room. Close-up of a Man Holding Green Mock-up Screen Smartphone in His Hands. Using Modern High End Device. In the Background Cozy Living Room or Home Office. First Person Close-up of the Man Holding Green Screen Smartphone in Landscape Mode and Playing in a Racing Video Game by Tilting Mobile Phone. Background Cozy Living Room. Medium dolly shot of a caucasian woman comfortable on her living room couch, holding a tablet, scrolling down, then clicking, TV on in the background. Both on green screen with tracking marks.